Russia’s Mariia Boncharova/Maria Voronina rallied past Dutch pair Raisa Schoon/Emi van Driel for the U19 Women’s Beach World title on Sunday. No. 6 Boncharova/Voronina dropped the opening set 21-19, but rebounded with a pair of deuce set wins 21-19, 15-13 to claim the crown. The Russians made their way through a trio of straight wins to take Pool F, besting Bolivia’s Maria Canedo/Nicole Nogales, Mozambique’s Mercia Mucheza/Ana Sinaportar and Germany’s Lea Sophie Kunst/Anna-Lena Grune. In the round of 16 and quarterfinals the Russia’s downed Ukraine’s No. 7 Kateryna Dashevska/Sofiia Rylova and Canada’s Erika Vermette/Dana Roskic respectively in straight sets. The pair had to fight through its first tiebreak of the tournament to reach the final, eventually moving past Spain’s Alvarez/Moreno 21-16, 18-21, 15-8. Third seeded Schoon/Van Driel won the Pool C title with a tiebreak win over Spain’s Daniela Alvarez/Tania Moreno (17-21, 21-15, 15-10) and straight-set wins over Egypt’s Nada Hamdy/Nariman ‘Niro’ Yasser and Italy’s Claudia Scampoli/Nicol Bertozzi. In the round of 16, the pair outdid Brazil’s No. 2 seed Thamela Coradello Galil/Anne Karolayne Figueredo Gois 21-16, 21-14. A quarterfinal win over China’s No. 8 Jie Dong/Ting Hang and a semifinal effort against fourth seeded Americans Devon Newberry/Lindsey Sparks paved the final steps to the title match. Spain’s Alvarez/Moreno came through in tiebreak to top Newberry/Sparks for the bronze. The Americans struck first at 21-10, but the Spaniards awoke for a 21-18, 15-12 victory. On the men’s side, the title race came down to Russia’s Denis Shekunov/Dmitrii Veretiuk and Germany’s Lukas Pfretzschner/Filip John, with the Russians getting revenge for a pool play loss to their foes with a 21-19, 21-18 finals win. No. 31 Shekunov/Veretiuk lost their opening two matches of pool play, falling to Gabriel/Pisco and the Germans, but stayed alive in the tournament with a straight-set effort against Paraguay’s Jorge Riveros/Gonzalo Melgarejo in the pool finale. 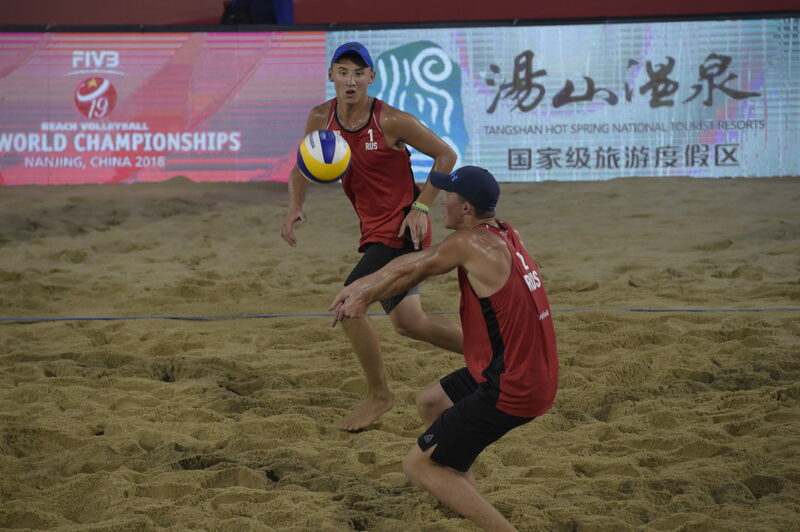 Once in the elimination rounds, the duo notched a trio of straight set wins, ousting Chile’s Vicente Drougett/Gaspar Lammel, Germans Rudy Schneider/Simon Pfretzchner and Thailand’s Phichakon Narathon/Phanupong Thanan. A semifinal win over seventh-ranked countrymen Alexey Gusev/Pavel Shustrov put the pair in line for the title. No. 15 Pfretzschner/John took the Pool B title, including a tiebreak win over their finals foe (13-21, 23-21, 15-11) in their second match. The pair edged past Brazil’s No. 2 seed Gabriel Zuliani/Gabriel Pisco (21-18, 13-21, 15-11) to wrap up Pool B play. After earning a free pass to the Round of 16, Pfretzschner/John swept past Mozambique’s Jorge Monjane/Arsenio Guvu and Poland’s No. 5 Dominik Poznanski/Mikolaj Miszczuk in straight sets. It took a tiebreak win over Argentina’s No. 9 Mauro Zelayeta/Bautista Amieva to reach the semifinal. Russia added a second medal to their trophy case as Gusev/Shustrov swept Zelayeta/Amieva for the bronze 21-18, 21-16.